Will Wyoming turn to firing squads for executions? CHEYENNE, Wyo. -- Prompted by the shortages of available drugs for lethal injections, Wyoming lawmakers are considering changing state law to permit the execution of condemned inmates by firing squad. A Wyoming legislative committee has directed its staff to draft a firing-squad bill for consideration ahead of next year's legislative session starting in January. 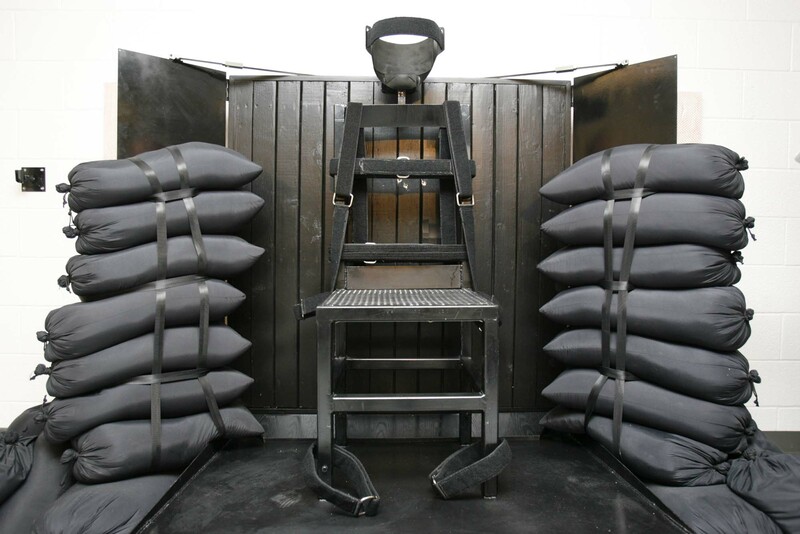 Lawmakers in Utah also may consider a return to firing squads for civilian executions. A Republican state lawmaker there recently announced that he intends to introduce firing-squad legislation in his state's next legislative session in January as well. Utah outlawed execution by firing squad in 2004 but kept it as an option for inmates convicted before that time. It last executed an inmate by firing squad in 2010. British woman's efforts stopped supply of execution drug to U.S.
Bob Lampert, director of the Wyoming Department of Corrections, told members of the Wyoming Legislature's Joint Interim Judiciary Committee last week in Rawlins that drugs for lethal injection have become increasingly difficult to obtain. "In the event that we had an execution scheduled and we couldn't carry it out as a result of lack of substances, I suggested to the Joint Judiciary that we may want to consider having an alternate means of execution, such as the firing squad," Lampert said Wednesday. Current state law specifies Wyoming would execute condemned inmates in a gas chamber, which the state doesn't currently have, as a backup to lethal injection only if lethal injection were found to be unconstitutional. Existing state law doesn't address how the state should proceed in response to a drug shortage. Lethal injection is becoming increasingly difficult for states to perform as pharmaceutical companies withhold drug compounds that states traditionally have used. Some inmates have raised constitutional challenges as states have turned to untried compounds. Wyoming has no execution drugs on hand, Lampert said. Last month, Oklahoma inmate Clayton Lockett died of a heart attack more than 40 minutes after corrections officials there started trying to administer drugs at his execution. President Obama called the Lockett incident deeply troubling and said he had asked his attorney general to review the application of the death penalty. Sen. Bruce Burns, R-Sheridan, had proposed a bill in the state's legislative session earlier this year to change state law to allow the use of firing squads. He's a member of the judiciary committee. Burns said Wednesday the committee intends to consider the firing-squad approach at its next meeting in July. He floated a bill in the legislative session early this year calling for allowing use of the firing squad, but it failed an introductory vote. Burns said his fellow lawmakers increasingly seem to recognize that the state needs to act. Burns said he believes using the firing squad would be a preferable means of execution to lethal injection, in which inmates feel the needle and then have to wait for drugs to take effect. Wyoming has only one inmate on death row: Dale Wayne Eaton, 69, is pressing a federal appeal of the state court death penalty he received in 2004 for the murder of Lisa Marie Kimmell, 18, of Billings, Montana. Cheyenne lawyer Terry Harris represents Eaton in his federal appeal. An attempt to reach Harris for comment Wednesday wasn't immediately successful. Rep. Stephen Watt, R-Rock Springs, serves on the Joint Interim Judiciary Committee. He said he intends to sponsor a bill in the state's coming legislative session to do away with the death penalty entirely but doesn't expect it will get much support. Watt is a former Wyoming Highway Patrol trooper who was severely injured in a gunfight on the job years ago. "The biggest and probably the most important one is probably my Christian beliefs that it's wrong for man to kill man," Watt said Wednesday of his opposition to the death penalty. "The second one is because of technology. All the time, we're coming up with more and more technology, and we're finding innocent people that have been wrongly convicted and sentenced to die. It would be a tragedy for one innocent person to die." Watt said he doesn't consider the firing squad to be a more humane alternative to lethal injection. "I've been shot," he said. "And I don't care how quickly death comes from firing squad. It still hurts and it's still terrifying. And I think it's cruel and unusual."